The iron collected through the ‘Loha’ campaign will be melted, converted into rebar, and used in the foundation of the Statue of Unity to build the World’s Tallest Statue. Artist’s impression of proposed world’s largest statue of Sardar Vallabhbhai Patel at Sardar Sarovar dam site. 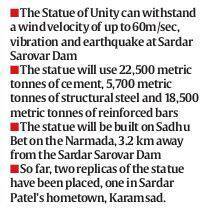 The iron collected over two years for the Statue of Unity project-a 182-metre tall statue of Sardar Vallabhbhai Patel to be built in Vadodara facing the Narmada Dam-is likely to be part of an art work to be displayed there, and unlikely to be used in the main structure of the statue, say officials associated with the project. This has come in sharp contrast to the original plan of the project. KV Sanghavi, Chief Engineer, Project Director & Director (Canals) for Sardar Sarovar Narmada Nigam Ltd (SSNNL), said that though the Sardar Vallabhbhai Patel Rashtriya Ekta Trust (SVPRET) is yet to take a decision on how the metal could be used, the sentimental value attached to the drive could result in a separate display art work. “We are not going to use the iron for the main structure as we are not very sure about its quality. If we use it, a lot of technical process will have to be done. It is more a sentiment-related issue and we will be using it in the non-structural part or for display. We could make an art work or a show piece out of it that can be displayed in the open. What it would be or how it would look, has not been finalised,” Sanghavi told The Indian Express. The SSNNL has so far collected 1,69,078 kits containing iron tools each weighing nearly 700 grams from across the country, as against the target of three lakh kits of iron tools from farmers’ contributions. The government constituted the SVPRET, chaired by the incumbent chief minister, as the executing body for the statue which is also supported by people’s funding. “The iron tool collection is now complete and we have received no fresh kits since the beginning of this year,” said an officer. Last year, the Gujarat government had roped in Gujarat State Fertilizers Company (GSFC) and Gujarat Narmada Valley Fertilisers (GNFC) – two of its major PSUs to complete its “iron collection drive”. The kits containing the iron metal were stocked in the SSNNL godown in Chhani. Recently, the engineering teams working on the design of the statue conducted a detailed ‘light and shadow’ study to ascertain its “look” at any time of the day or season. According to officials, the study will help to decide the orientation of the statue with respect to the light. The engineering team will also begin wind tunnel tests at the site, after completing the geo-technical and hydrological survey tests. Sanghavi says that the reinforcement steel for the main structure will be of first quality. “There are many parts of the project for which we can use the steel and even roll it if necessary. Nothing has been planned as of now. Depending upon its metallurgy, things can be added or subtracted from the scrap during the process of extraction,” he said.